Participating in divine worship services as a choir member is a sacred responsibility. Choir members, as church musicians, offer their God-given talents to the faith for a variety of reasons. For most, it is a part of their stewardship – the giving of their “time and talent” and something that they enjoy. In Orthodox services, choir members represent the laity, responding to the liturgical dialogue set by the priest. This places a sacred responsibility on them during our worship services. They are called to be knowledgeable not only of the hymns and responses, but also about the correct order of the worship services, and as such the choir is entrusted to be a participating part of the worship service. The music of the Orthodox Church is an integral part of worship services as it adds to the prayerful environment of worship. Not all choir members are trained musicians, nor are they all able to read music, however, this does not take away from their ability to give their whole heart in concert of praise to God. Led by Stacey Grimaldi, the Saint Barbara Church choir is acclaimed for its excellence and dedication in chanting Orthodox Church music in a manner that enhances the liturgical experience. In the past our Choir has presented Christmas Concerts, recorded a CD of Liturgical Hymns, offered a wonderful concert during our Annual Odyssey Festival and are always open to welcoming new members into the group. Their voices, together with the voices of our chanters, add to the prayerfulness of our services as we are inspired by their love of sacred church music. Click here to hear a sample of the Choir's beautiful new CD. A chanter (in Greek, ψάλτης) is a layperson who leads the congregation in the chanting of responses and hymns in the services of the church. Particularly in the Byzantine tradition, the lead cantor is referred to as the protopsaltis (προτοψάλτης). The Chanters of our community lead us in the singing of the hymns of the service of Matins and Vespers in addition to many of the other sacraments of the Church. The Saint Barbara Sunday School Choir encourages children to chant hymns and become active participants during the Divine Liturgy and other church services. The Children’s Choir chants responses and hymns of the Divine Liturgy on the Saturday of Lazarus. The choir also leads the faithful in the singing of the carols during the Annual Christmas Pageant, providing inspiration for all who attend. The Archdiocesan Department of Religious Education together with the Department of Internet Ministries have provided Orthodox Christians throughout the world with a wonderful opportunity to study and learn Byzantine Chant. Simply go to http://chant.hchc.edu There you will find a multimedia presentation of many hymns of the Orthodox Church. Each hymn is presented in Byzantine and Western notation, chanted in Greek and English, by both a male and female. 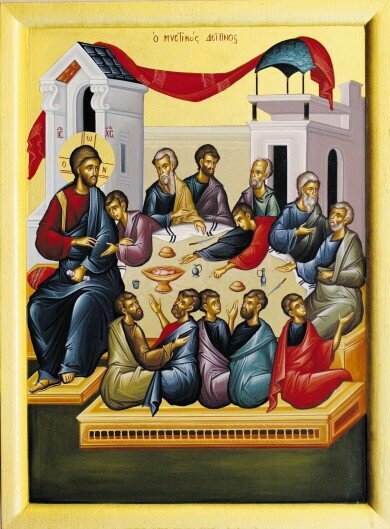 In addition to the hymns, the web site also presents information regarding the major feasts of our faith, including an explanation of the icon, theology, history, rubrics, scripture and canons concerning these feasts. The program also includes a section instructing visitors on how to read Byzantine notation. The Archdiocesan School of Byzantine Music was founded in 2010 and is a ministry that strives to offer the opportunity of learning the ageless liturgical music of the Greek Orthodox Church. The school is comprsed of over 40 students enrolled, both men and women, ranging from 7 yrs to over 50 yrs old. The School has also established a professional choir (the Archdiocesan Byzantine Choir) comprised of 25 young Greek-American trained Byzantine chanters who have produced multiple recordings and most recently performed a concert at Carnegie Hall, New York. The School has published a book titled: Byzantine Music: Theory and Practice Guide, that seeks to assist students as they learn the theories of Orthodox liturgical chant. The Archdiocesan School of Byzantine Music is open to men, women, and children of all ages. Classes are conducted in Greek and/or English according to the linguistic needs of the students. Classes are held primarily on Saturdays. Formed in 2010, the members of the Archdiocesan Byzantine Choir consists of Greek American clergy and lay chanters ranging in age from sixteen to forty. Most are seasoned lead-chanters (protopsaltes) in churches of the New York Metropolitan area. All have formal training in Byzantine Music, while some hold advanced degrees from conservatories in Greece. The choir enjoys a broad programmatic reputation and ecclesiastical repertoire and has held performances in various venues such as Universities, Churches and numnerous Recital Halls of New York City. Its primary mission is to share the beauty of Byzantine Music beyond the borders of Orthodox Churches and reveal the spiritual depth of this ancient form of ecclesiastical chant. The Archdiocesan Youth Choir was established in 2001 with the goal of creating a children’s choir to display the proud roots of our Hellenic heritage through music. The members of the choir consist of children who are students of the Greek American Parochial, Afternoon Greek and Sunday Schools as well as colleges from our New York Metropolitan area. The choir has established an outstanding programmatic reputation and repertoire including ecclesiastic, classical, popular, ethnic and cultural songs from the Renaissance to the present day. It has grown significantly in size, becoming a prominent performing musical group. Committed to musical excellence, the choir gives talented young singers the opportunity to learn music of varied styles, collaborate with professional musicians, and perform at various prominent venues. Since its inception, the choir has been under the direction of Ms. Maria Koleva. Ms. Koleva was born in Bulgaria, where she attended the Conservatory in Sofia, studying piano with Milena Mollova. She then attended the Tchaikovsky State Academy of Music in Moscow, Russia on a full scholarship, studying Orchestral and Choral Conducting with Genadi Rozdestvenske. After graduation, she continued her studies receiving a Master’s Degree in Orchestral Conducting from the Vienna Music Academy in Austria. Her dedication to teaching and her creativity has led this choir to a level of excellence demonstrated by their performances and in the presentation of the choir as seasoned performers. The Choir’s dedication to musical excellence and broad range of musical presentation, has resulted in unique concerts and collaborative opportunities. In addition to its annual Spring and Christmas Concerts, the choir have performed concerts at the United Nations; Lincoln Center; New York City Hall; New York University; Sun Dome in Tampa, Florida; Nicosia, Cyprus; White House, Washington D.C. for President George Bush; the Zappeion, in Athens, Greece; White House, Washington D.C. for President Barack Obama; Cosmopolitan Club in New York City; Aghia Eirini in Constantinople, Turkey for Patriarch Bartholomew; and Carnegie Hall in New York City. The Federation of Greek Orthodox Church Musicians brings together all the church musicians of the Direct Archdiocesan District in order to encourage communication and fellowship among its members.The group seeks to promote and encourage the study, development, publication and performance of Greek Orthodox sacred music, fostering a high standard of singing and choral music among the choirs in the Federation. They offer lectures, workshops and conferences of Greek Orthodox church music and other aspects of music needed to improve the musical education of the Federation members; promoting the development of choir directors, organists, singers and chanters, while providing spiritual uplifting hymns for the faithful during the Divine Liturgy and any other Greek Orthodox service in choirs may participate.